The Porterhouse is kind of a composite steak coming from the point where the tenderloin and top loin meet. Basically an over-sized T-Bone steak. 2) Mix Olive Tapenade and rosemary in a small bowl to blend. 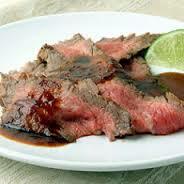 3) Sprinkle steaks with salt and generously with cracked black pepper. 4) Divide Roasted Garlic Oil between 2 heavy medium ovenproof skillets set over high heat. Add 1 steak to each skillet and cook until both are browned, about 3 minutes per side. 5) Spread half of the Olive Tapenade mixture atop each steak. Transfer skillets with steaks in oven. Cook both steaks until thermometer inserted into center of steaks registers 125F for medium-rare, about 20 minutes. Transfer both steaks to platter. 6) Pour 2 tbsp Balsamic Vinegar with Garlic into each skillet and cook over medium heat until liquid is slightly reduced, scraping up browned bits, about 1 minute. 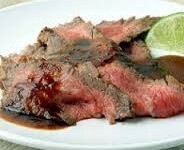 Drizzle hot skillet juices over each steak and serve.